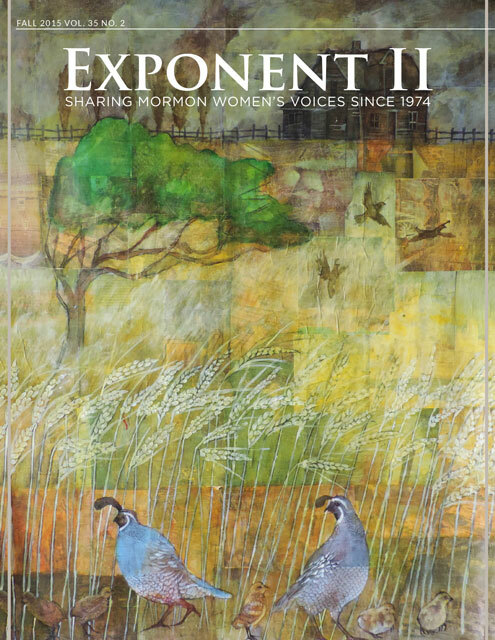 As always, this spring’s Exponent II Magazine, is a moving collection of artwork, poetry, and essays telling many stories about Mormon Women. I would like to highlight one particular essay entitled “Always Hope: A Colombine Survivor’s Story” by Kathy Carlston. There have been times where I’m in the middle of a storm and I can’t feel God, so I go into a rage, cry myself to sleep, and give up on Him. But eventually the storms do end. When I look back, there are times when it’s so clear to me how God walked with me every step of the way. As a freshman in high school, I woke up on Tuesday, April 20, 1999 with no idea that my world would be turned upside down in a few hours. I went to my morning classes, went to lunch, and bought a slice of pizza that came with a giant, free chocolate chip cookie. Free Cookie Tuesday was my favorite day of the week. I sat down at a table in the cafeteria with my friends and had only taken a couple of bites of pizza when there was a huge commotion. Everyone’s attention was pointed toward the corner of the cafeteria by the Teacher’s Lounge. My sister’s basketball coach, Dave Sanders, got all our attention by shouting that there was someone with a gun outside and we needed to get down. I thought it was a prank, but a few seconds later we heard a couple of pops from guns. Instantly the cafeteria was a sea of people, staying low and scuttling across the cafeteria floor. A few more pops. The panic in the room rose to a fever pitch. Suddenly, everyone around me got to their feet and started running up the stairs, to the main hallway. I got up and ran with them. A boy I grew up with darted into the science hall, and I made an instinctive decision to follow him. Momentum carried me past the first classroom, and when we tried the second classroom’s door, it was locked! We were absolutely terrified. We tried the third room, which thankfully opened. There was already a class in the room, and some students explained what was going on. The teacher turned out the lights and had us pile up along the wall next to the door so that we wouldn’t be seen from the door’s window. We huddled together, shivering on the tile and silently crying. A few moments later, Coach Sanders opened the door and fell on his face into the classroom. He had been shot twice through the chest. He crawled under some nearby desks. No one dared move. We could hear the shooters whooping and shooting their guns as they ran through the hallway outside of our door. We could feel the floor vibrate as their bombs went off in the cafeteria below us. I was lying between two other freshmen, closing my eyes in pure fear and shock. After a few minutes, a chemistry teacher opened the door, but she saw Coach Sanders and left to find help and supplies. Soon another teacher and a boy I knew from another ward at church came in and asked us if anyone knew first aid. A boy from my choir class volunteered, and the guys in the room gave their shirts to press Coach Sanders’ wounds. One of the teachers called 911 for instructions and to tell the EMTs where we were. Hours passed. Every so often we would hear from the Emergency Response teams who were looking for us but were in the wrong part of the building. Once a helicopter flew right up to the window, but all they could do was wave in an attempt to let us know that they were trying. We sat and watched Coach Sanders get First Aid, hoping and praying that he would make it and that help would come soon. A teacher I’d had for geology, Mrs. Wyatt, came in the room and just sat with us, talking to students individually, holding their hands in hers and listening. Finally, the SWAT team arrived and ordered us out of the room in single file. Before I left the room, I turned back to make sure that Coach Sanders was still breathing. He was, and the SWAT team surrounded him, talking with him and with the boys who had been giving him first aid. I whispered “I love you Dave,” and filed out of the room. The SWAT team gathered us and people from a few other classrooms together and then led us through the cafeteria, which was now flooded from the fire sprinklers. We were ushered out the door by the teacher’s lounge, but the entrance was blocked by the glass from a shot out window. There was a student near me in line who didn’t have any shoes. They must have fallen off while running away from the shooters. Before this student even asked for help, Mrs. Wyatt scooped her up and carried her past the broken glass. We ran out the door and up the cement staircase next to the building. I ran past two students who had passed away on the hill. I was in shock but pushed myself to keep moving. Finally, we were gathered in an outdoor alcove and were loaded into squad cars. We drove through neighboring Clement Park, where I eventually found my dad, gave him a big hug, and he drove me home. We found out from the news that Coach Dave Sanders had passed away in the school, leaving behind his wife and his daughters. I’m not going to do the aftermath justice, but it was excruciatingly painful. I felt an enormous amount of guilt because of a worry that I had let Coach Sanders die. I blamed myself because I felt that if I had had the Spirit with me to a higher degree, I would have been able to receive answers for how to save him. He was my sister’s basketball coach, and as I watched her heart break over and over and watched her grieve her loss, I became angrier and angrier with myself. Having gone through a lot of therapy over the years, I now know that my self-blame was irrational, and that the best thing I could have done for Coach Sanders that day was to keep quiet and stay out of the way, which I did, but for many years it was a very deep and painful dilemma. A lot of people go through similar things when they experience trauma—they call it survivor’s guilt. While in some ways it’s nice to know that it was a normal reaction, I hate that so many people have to feel that kind of pain. In addition to this guilt, my sister, friends, and I suffered from flashbacks, constant fear of a repeat event, depression, and a myriad of other things. Plus the media swarmed into our community in droves and were extremely intrusive, especially to the families of people who had passed on or who were injured. One thing that always bothered me about how the media reported the story was that they focused almost exclusively on the negative things that happened. While it was gut-wrenchingly hard to go through, and truly awful things did happen, there were many, many serendipitous things that occurred that I wish had been more widely known. While the shooting was going on, there happened to be folks in the houses right next to the high school who were trained as medics and had served in Vietnam. They set up an impromptu triage center where they began treatment on victims. These wonderful people, and people like them, who were in the right place, at the right time, doing their best to help, saved the lives of all of the kids who were able to make it out of the school and into the hospital. Reflecting on these seemingly small acts taught me that hope is truly present, even in the midst of terrible tragedy. When I remember how my geology teacher, Mrs. Wyatt took the time to take the hands of individual students into hers, asking them questions about how they were feeling and quietly, thoughtfully listening to their responses, I feel that hope. Even though I was not one of the students who she had the chance to reach out to, it meant the world to me to witness it. Mrs. Wyatt simply did what she knew to be right and good. In the middle of a war zone, Mrs. Wyatt became a hero. It’s possible that her acts of kindness were only remembered by me, but the fact is that they are remembered by me. In fact, they are cherished by me. In the midst of an unimaginable nightmare, I feel like I was able to see an angel masquerading as a human in the very room where I was. Her acts were simple. She saw a need and she filled it. It was as simple and profound as that. The event and the aftermath really helped me realize how much God is there, often working in the background. That first night when I got home, I was terrified to go to sleep. I knew that I’d relive the event over and over again in my dreams. I knelt down, and at the brink of exhaustion told God that I didn’t want to have nightmares that night. I woke up the next day and didn’t remember any of my dreams. Then the next day I was also nightmare-free. It’s been nearly 14 years, and for some reason I’ve still never had a nightmare about the shooting or what I saw that day. While the events of that day were horrible, terrifying, and forever changed me, I believe that God’s love was there, shepherding us through, trying to get us back out to the light of day. In many ways, the effects from Columbine were with me for many years. I’m sure in some ways they still affect me, but with each year, I’ve healed more and more and have been able to grow and trust people again. I saw many skilled and caring therapists who helped me sort out what was going on inside of me, and I had a fantastic support network of family and friends. Now that I’m completely finished with all my schooling, the anniversary isn’t nearly as scary for me as it was before. The year after the tragedy happened, a holocaust survivor named Gerda Weissmann Klein came and spoke to our school. She said something that I’ll never forget. After telling us her life story, focusing on her experience in WWII, she said this: “Pain is pain.” She then explained that even though we want to compare our pain to another, supposing that one is more significant than the other, that’s not the case because any pain suffered is painful. It doesn’t matter where it came from, our pains are equally hurtful. When we’re our best selves, we try our best to provide love, support, and comfort to one another. My experiences on that dark day in 1999, as well as many since, have taught me that love heals, kindness comforts, and we can heal wounds with one act of kindness at a time. Even though things are scary, I promise that there is always hope. Please believe that. Poster’s note: I feel a bit odd having posted this this evening, having not known about the horrific incident at the Boston Marathon until afterwards (it really is a rare day for me not to check the news or Facebook or for people at work not to talk about the news). I hope that people will feel the power of Kathy’s message in the face of all types of tragedies. I pray for the people injured today – that they will be healed. And I really pray for an end to violence. I feel the world weeping on so many levels. Thank you for sharing this, here. Kathy’s essay is a beautiful, important reminder about how to find healing in the face of life’s true horrors. However coincidental it was, the timing of your posting was just right–I needed to reread this after last night’s fitful sleep. Thank you. This is one of my favorite pieces in our Spring issue and it felt so timely. Thank you, Kelly Ann and Kathy.